if you've seen my "things we love 2015" list, you already know that the essentials by ellen mondo poinsettia stamp set is one of my favorites! i love the larger size and beautiful lines. -i started with a 4-1/4 x 5-1/2 piece of neenah natural white cardstock (the name is a little misleading, it's a really pretty creamy color). 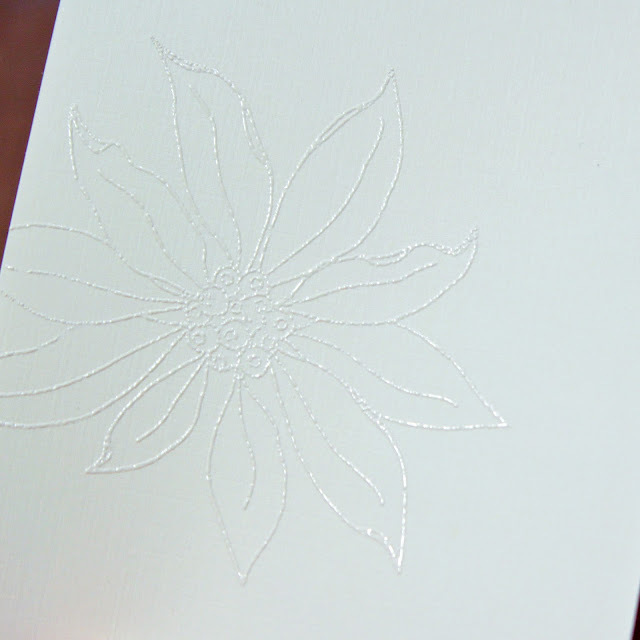 on my cardstock, i stamped the larger poinsettia in white and heat embossed it with a weathered white (creamy colored) powder. 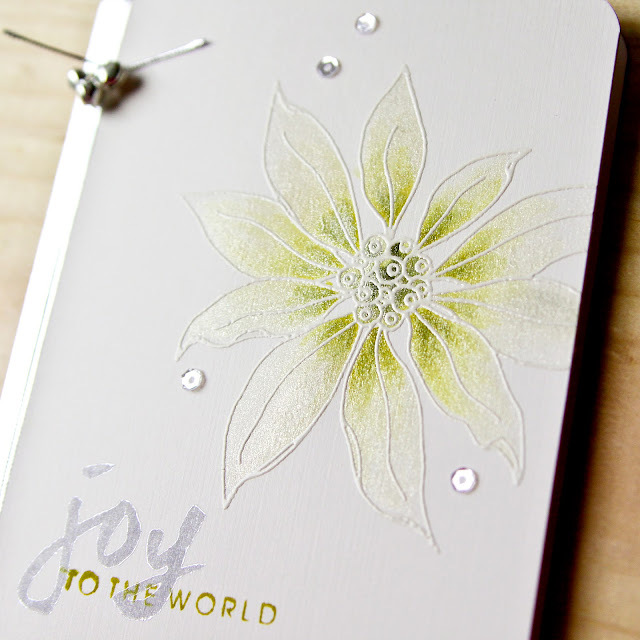 -next i used distress inks crushed olive and forest moss to watercolor the poinsettia center. 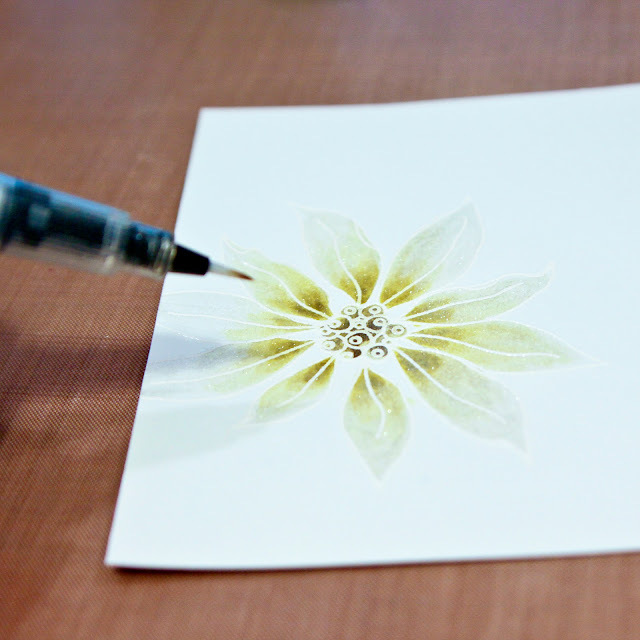 and while the ink was still wet, i used a clear wink of stella pen to blend the color outward. -i made sure each petal was blended and had a good layer of shimmer. -next i added a sentiment from the essentials by ellen brushstroke christmas set, stamping "joy" in silver and "to the world" in distress ink crushed olive. -i trimmed 1/4 from one side and rounded the corners on one side. -i cut a 1/4 x 5-1/2 piece of silver foil and adhered it to a 4-1/2 x 5-1/2 natural white card. 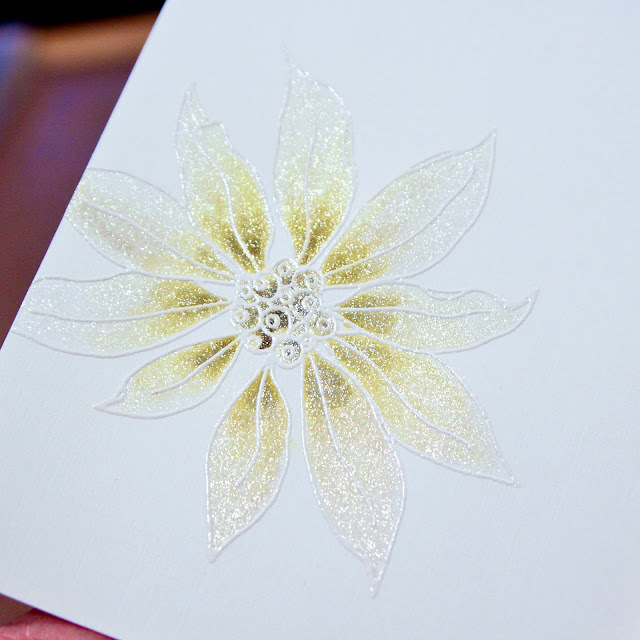 then i adhered my stamped panel onto the card. -finally i finished with silver cord, jingle bells and a few sequins. p.s. don't forget you can still enter my "things we love" giveaway and use the thingswelovecarly 10% off discount code at ellen hutson! The poinsettia is so pretty with all that shimmer!